Raise your hand if you're totally down with a cozy night in instead of a night out on the town most nights. I'm raising my hand so high that even if you're around the world you probably see it! Haha! Better yet, I want everything on this list. Golden Girls Clue game? Sign me the heck up right now. I'm not even that big on game nights, but you throw Golden Girls into the mix? I'm soooo there. I'm a Dorothy, hands down. Which Golden Girl are you? Inquiring minds want to know! And yes, my love of bears and Mitch Albom is also shown. But this is just a bookmark to give you ideas on the theme. 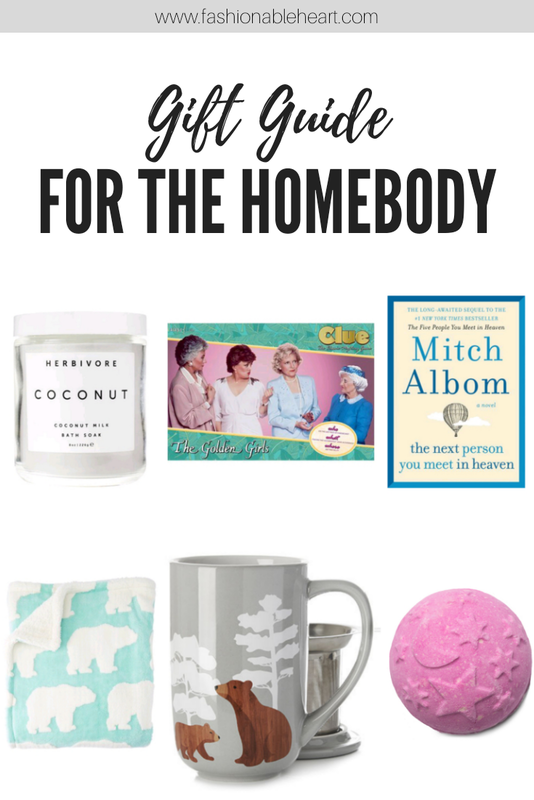 But if you do want any of the below items, you and I are basically best friends now! Sorry, not sorry. ;) Hope this guide does give you a few ideas! Something Moisturizing (via Sephora, $22.50 CA) - The heat blasting indoors can be brutal. Why not gift a nice lotion, hand cream, or bath soak to help in the battle? Board Game (via Chapters, $49.95 CA) - Staying in and watching Netflix gets old. Sometimes a good game night is needed and it gets your friends to stay in and come to you. So you've won already by not having to go out, am I right?! Book (via Chapters, $29.99 CA) - Sports for the sports nut. Music for the musician. Whatever it is the person likes, there's a book for it. I personally read everything and never turn down a book. Cozy Blanket (via Chapters, $59.50 CA) - Because you can't have too many and nothing beats wrapping up into a cocoon on the couch. Especially on a rainy or snowy day. That's when it is the absolute best. Cute Mug (via DAVIDsTEA, $23 CA) - Hot chocolate, coffee, tea. Whatever you want. I think it should be a scientific fact that everything tastes better in a cute mug. Pamper Night (via LUSH, $6.95 CA) - Maybe put together a little care basket or just wrap a nice bath bomb for them to treat themselves. One of my favorite ways to unwind!